no mas pantalones: Flying Coffin "Halloween 2013"
In their sixth year of releasing a new shirt to celebrate the holiday season, Flying Coffin is offering up something really special with their "Halloween 2013" t shirt. In a nod to its roots, the design is a reissue of their inaugural 2007 piece. 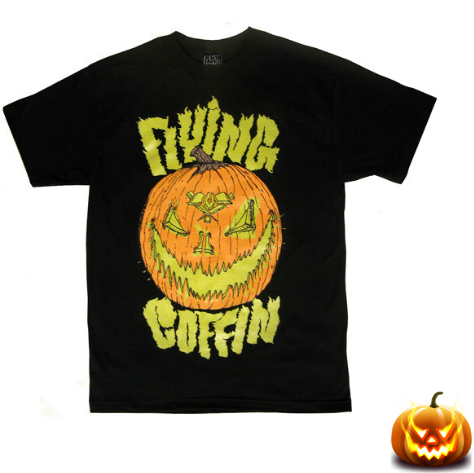 It features a damn frightful looking jack o' lantern with the "Flying Coffin" logo carved in his forehead Manson-style. Spooky type work, yellow glow-in-the-dark ink, and a limited release of 31 pieces make for a devishly appropriate torso cover for your meat suit.